I ran across the latest blog posting by my friend The Broke Socialite this morning, and what perfect timing - she linked through to this article on the Privilege blog about how to WASP Up Your Work Clothes, genius! Cute little article, you should check both out. But it reminded me that I had wanted to tell you all sometime about finding the perfect work bag, sometimes known as the Power Bag. When I started work, I knew that I really shouldn't be carrying my fav Vera into work each day. That Bermuda Blue paisley really doesn't convey much business prowess, nor does it really match many work outfits beyond a teal shirt. But I was also on a budget, and needed to really research my options. So within a few months of starting my job, I was off on the hunt for the perfect Power Bag. Something black, leather, and really good quality. I was not going to buy something that I'd need to replace in two years, or that would go out of style in one. I looked everywhere. Target didn't have then the cute ones that they have now, but you should check them out if you haven't already, they are priced very well. Stein Mart, Kohl's, and the department stores were also a big fail. I figured it was ok to be picky if I really wanted something quality. I ended up at Mori Luggage at the mall. One bag caught my eye for its quality and style, even though it wasn't quite my fit. I checked out the tag, and it said Gina B. I went home and Googled them, and as it turns out, they had (at the time) a whole line of adorable work and laptop bags. Since sold to kolobags, Gina B had the one Power Bag I was looking for - high quality black leather (though they also have them in white, as below) with a removeable laptop sleeve that fits my MacBook Pro. 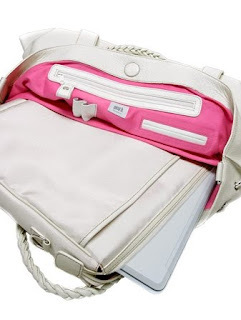 Cute hot pink interior, a removable shoulder strap, and great quality materials. Almost 2 years later, and the bag looks barely used, I swear. I highly recommend this one if you are in the market, since its a great carry-all for your laptop, papers, your lunch, a sweater, a magazine, etc.